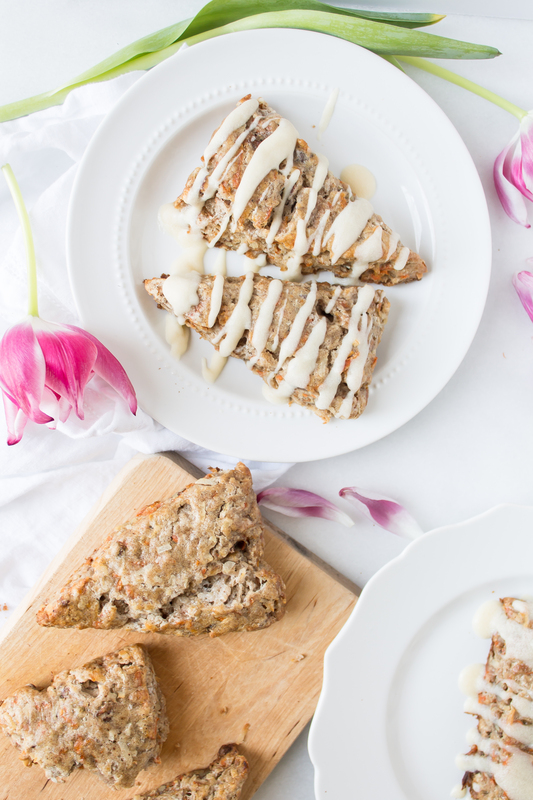 Carrot Cake Scones Recipe | Featured Food + Drink | Glitter, Inc.
Spring is in the air and Easter is just around the corner and have I got the perfect scones recipe for you! 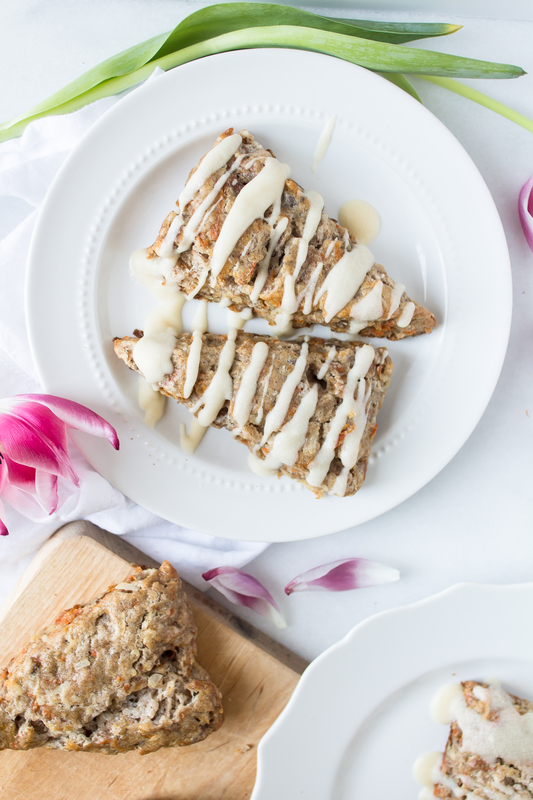 Say hello to the most amazing carrot cake scones with cream cheese glaze. 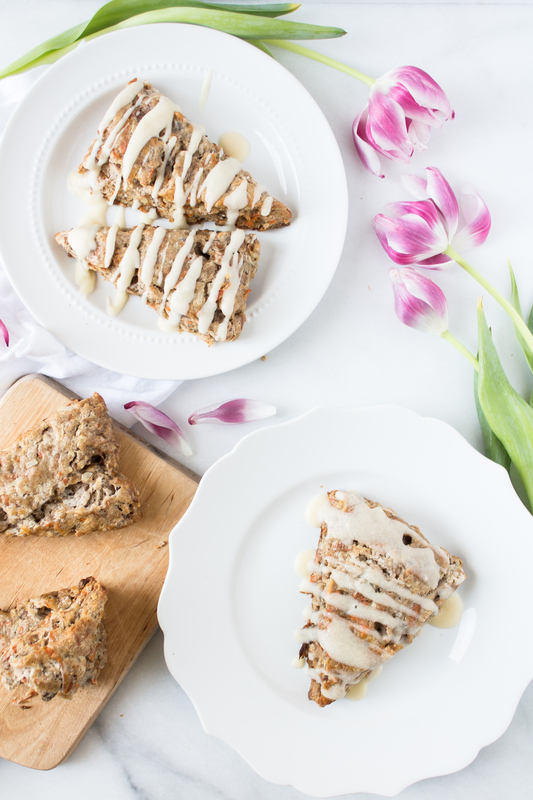 It’s carrot cake, turned into the perfect breakfast (or brunch) scone, and topped with a classic cream cheese frosting-style glaze. What more could you want? 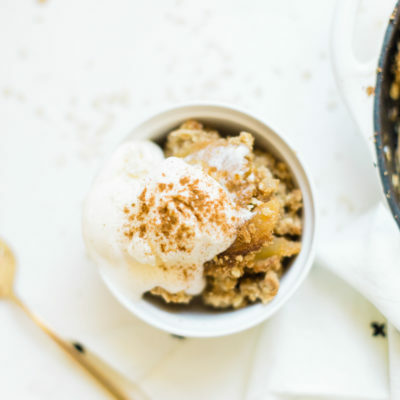 Any dessert that practically begs for an accompanying cup of coffee is my kind of dessert. 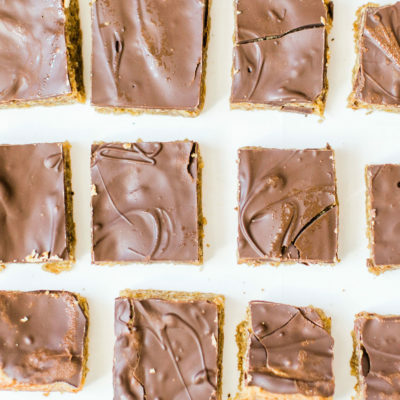 Plus, this totally counts as breakfast, which means CAKE for breakfast. Happy, happy. Preheat the oven to 400 degrees F. Lightly grease 2 baking sheets with non-stick cooking spray and set aside. In a large bowl, combine the flour, sugar, cinnamon, ginger, nutmeg, baking powder, baking soda, and salt. Cut the butter into small cubes and, while it is still very cold, add to the flour mixture. If the butter has gotten warm with the heat of your hands or from being on the cutting board too long, stick it back in the fridge for a few minutes before adding it to the flour mixture. Cut the butter into the flour mixture using two knives, a pastry cutter, or breaking the pieces of butter up with your fingers (my preference). You can also pulse the mixture in your food processer a few times. The butter should be about the size of peas when you are done. Do not overwork the butter. 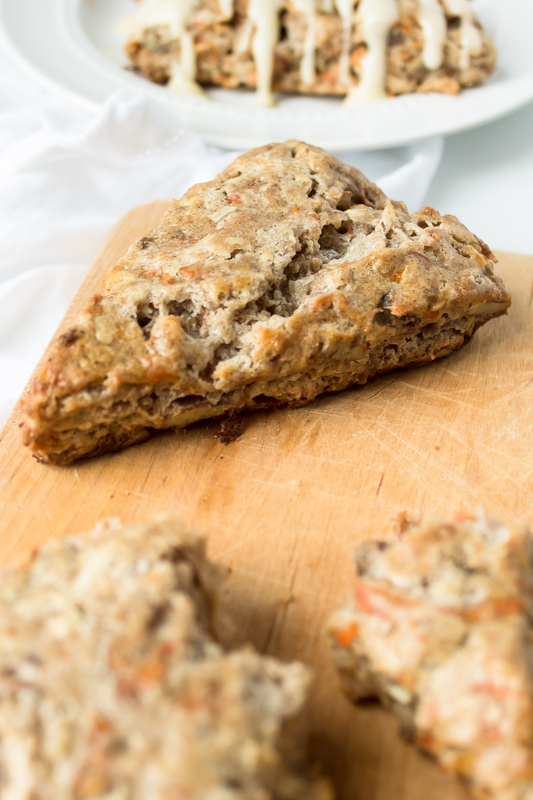 Add the shredded carrots, coconut, nuts, and raisins, if using, to the flour-butter mixture and stir to combine. Pour in the milk and mix until the ingredients are combined and the dough starts to stick together. You should be able to work the dough into a ball. Again, do not overwork the dough, otherwise your scones will be tough. If the dough is too dry, add more milk, one tablespoon at a time. Lightly flour a cutting board or a flat surface and transfer the dough to your surface. Split the dough in half, roll each half in a ball and pat them into 6-inch rounds that are about 1 to 1 ½ inches thick. Cut each round in half, then cut each half into 3-4 triangles (like a pie) and place the dough on your prepared baking sheets, a few inches apart from each other. Brush the egg wash on top of the dough and bake for 12-18 minutes (depending on the size of your wedges). The scones are done when the edges begin to get golden and the tops bounce back when you press a finger into them. They will continue to set as they cool, so they may not look fully done. Let the scones cool on the tray for about 3 minutes, then remove them from the tray and serve immediately. 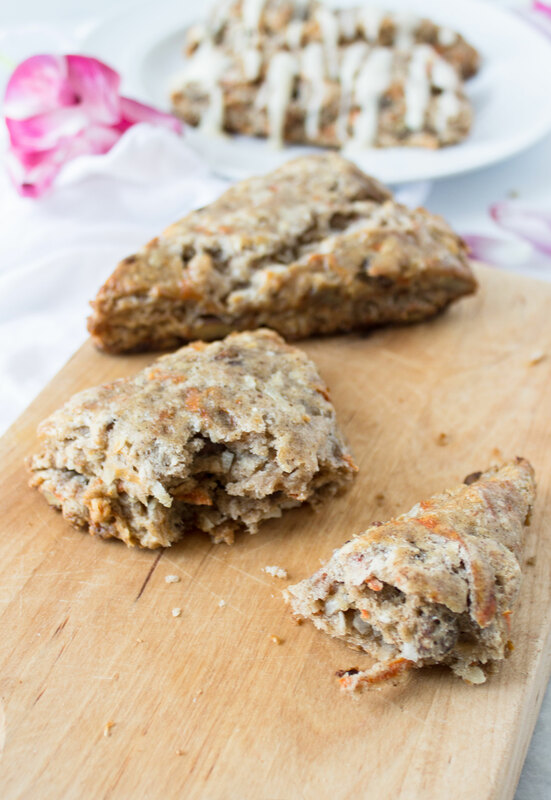 Carrot cake scones are best soon after they are baked, but one-day-old leftovers can be reheated in a microwave oven or an oven. Add some butter and they are as good as new. 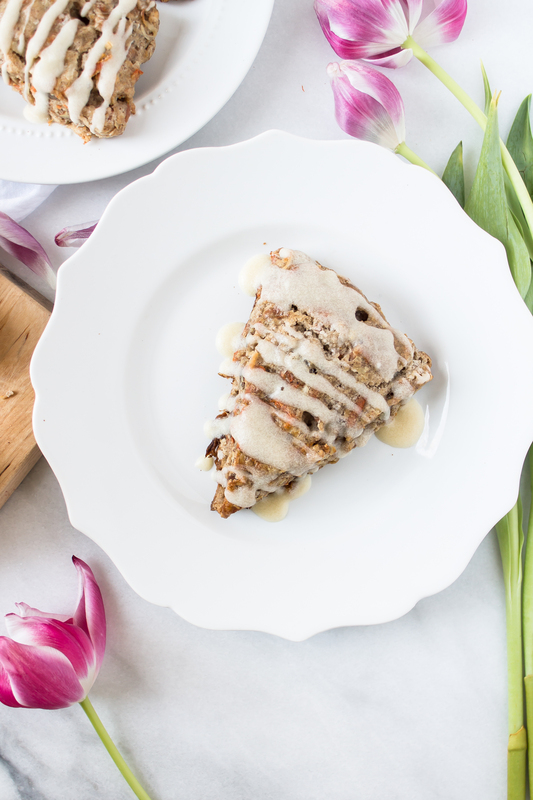 These can be made ahead of time (perfect for a spring breakfast or unexpected guests!). Stop after you pat the dough into rounds and wrap each round of dough in plastic wrap. Refrigerate until ready to bake and serve. 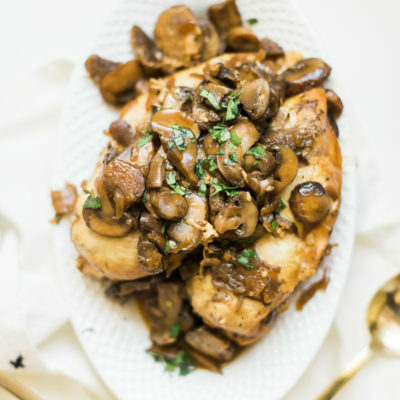 They can be made up to a week in advance if stored in the fridge, and up to a month ahead of time if stored in the freezer. If you freeze the dough, allow it to thaw in the fridge overnight before you bake it. 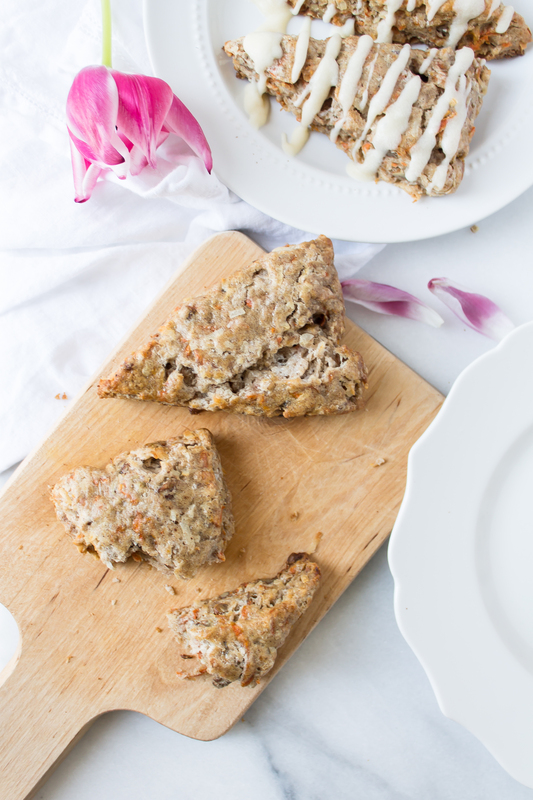 If you make your own carrot cake scones, be sure to tag me on social media (@glitterinclexi) so I can live vicariously through all of your delicious snacking! Recipe and Photos by Hope Woodhouse of Pass the Cookies for Glitter, Inc.
It’s Time for Another Shopbop Sale!